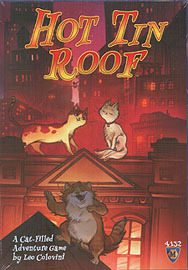 It’s night and you play a crew of cats living high above the busy city. Your lofty goal is simple: get your mighty furry gang back together. Move from rooftop to rooftop. Build catwalks and shelters wherever you can. Connect your cat buddies and collect tasty tribute from your fellow felines. Bring your cats together and get yummy food. Collect the most sardine cans and fish to become Top Cat! In order to win "Hot Tin Roof", you need to navigate the right paths, build the right shelters and dodge the fishy demands of your hungry rivals. Every game involves different paths to victory, so you better be nimble and quick, curious and catty… and oh so clever! After all, just being furry won’t make you the best cat on a hot tin roof!